Walking up to the grounds for day one of Wimbledon in 2009, I was surprised to hear most English tennis fans weren’t really talking about Andy Murray or the Rafa-Roger rivalry, but instead about the new starlet of British tennis: Laura Robson. The year before, Laura had won the Girl’s Singles title at Wimbledon, becoming the first home-grown champion in the singles bracket since 1984 and launching her into a kind of celebrity that garnered her an opening-day billing on Court No. 2 at the Championships in 2009. And this just wasn’t any opening-day match, but rather one that was opening the new stadium, making Robson the name to watch on the court’s first-ever match. 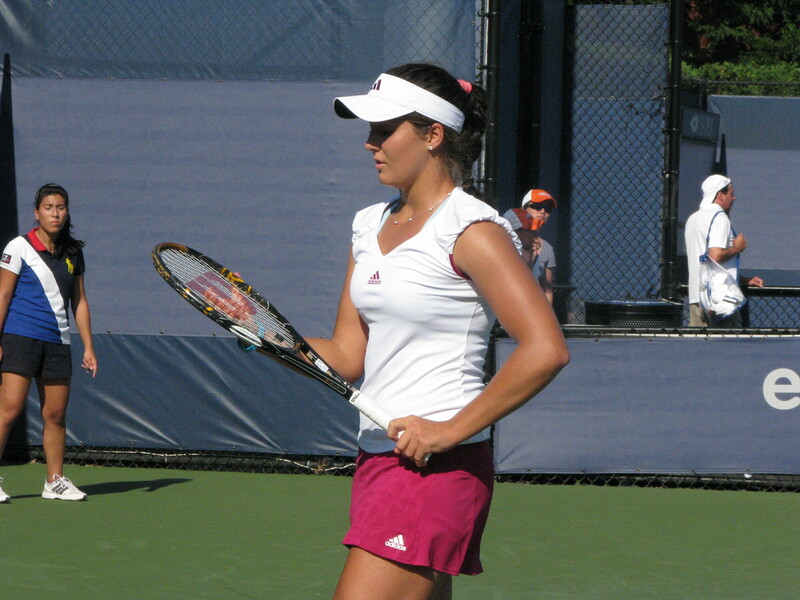 Since her run at Wimbledon in ’08 and her ’09 ceremonial opening, Robson has made a habit of playing a contained schedule mixed of both girls junior events and WTA and ITF circuit matches. The past two US Opens, the 16-year-old Brit has bowed out in the the third round of qualifying, just short of a shot at the main draw. This week in Tokyo, however, Robson qualified for the main draw [PDF] of a WTA tournament for just the second time in her career (Birmingham, 2010). She lost in the opening round to Greta Arn, but some say the calculated approach by Team Robson to keep the young Brit on a light schedule and continue to grow her physically and mentally (she played one official tournament between Wimbledon and the Open) could pay dividends in her future. But before we get all crystal ball on you, we were happy to get a few questions into Laura via email. She’s an active Tweeter, with a good sense of (dry, British) humor, and has professed love for Neil Patrick Harris, Chipotle, YouTube watching, Bikram yoga, fantasy football (soccer) and much, much more. TSF: If you could meet Neil Patrick Harris in person, what would you ask him? Laura Robson: I would ask “How did you get so cool?”. TSF: After winning a match in the States, are you most likely headed to a Chipotle? How many times did you go there while in New York? LR: After a match I am most likely to head anywhere that is going to be relatively quick, Chipotle is perfect for that reason. We must have gone there 5 or 6 times throughout the whole trip. TSF: What’s your hidden talent? Like something that would make you a YouTube star? LR: I can juggle pretty well. Really bad singers also become popular on YouTube. I could be one of those people. TSF: Last year it was “Party in the USA.” What song are you jamming out to at this US Open? LR: This US Open I was rocking out to Lenny Kravitz, Drake and I listen to a lot of Dubstep music (if you haven’t heard any Dubstep, YouTube ‘Four Floors (Diplo Edit) – Sunday Girl‘). Sounds amazing on massive speakers. More with Laura Robson, BFF to FortyDeuceTwits, after the cut. 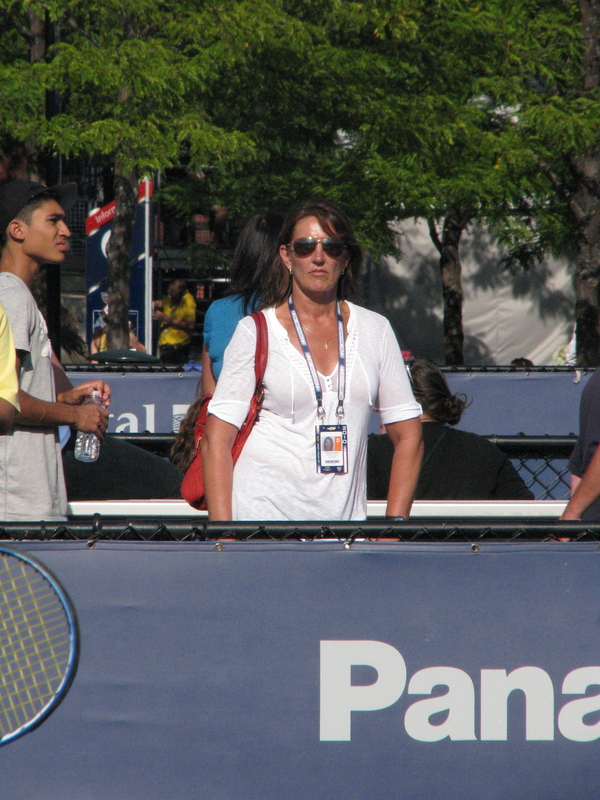 Laura’s ‘mum’, Kathy, with her gorgeous burnt orange leather bag, keeping watch over her daughter at the Open, 2010. TSF: We loved your mom’s purse during your qualifying match. Do the two of you share stuff? Shop together? LR: I’ll tell mum you loved it, she is very proud of that bag. I have used a few of her other bags in the past but I mostly stick to my own stuff. We do shop together sometimes but my mum would much prefer shopping in the ‘Home’ section. LR: Best American saying. I really have no idea so I’m just going to go for “That’s so fetch.” Mean Girls classic. TSF: If you could use your Wilson tennis racket to do something else other than play tennis what would you use it for? LR: I would cut the strings out of the racket and attempt to make it a picture frame. This entry was posted on September 26, 2010 at 10:11 am and is filed under Erwin Ong, juniors, laura robson, nick mccarvel, tennis, twitter, U.S. Open, wilson. You can follow any responses to this entry through the RSS 2.0 feed. You can leave a response, or trackback from your own site. great stuff, she sounds like a lot of fun!